The warm fuzzies in my class are different sizes. The size of the warm fuzzy depends on the behavior. For example, pushing in your chair is following classroom rules; however, it is expected and therefore worth a smaller warm fuzzy. Handling frustrating situations in an appropriate way is worth a larger warm fuzzy because it requires more self control and determination to achieve. “It really bothers me when you ____. Can you please ____?” is a hard phrase for adults sometimes so hearing a kindergartener say it is pretty amazing. For example, you are extrinsically motivated to go to work because you are getting paid to be there (ok, so teachers are not a good example of this because some of us are actually intrinsically motivated to be at work- we enjoy teaching and gain happiness from it.) However, other people in the world go to work for the sole purpose of getting paid. This is extrinsic motivation. Doing something you don’t want to do in order to not get punished is also an example of extrinsic motivation. When Little Johnny thinks to himself “I don’t want to clean up the blocks right now, but I am going to because if I don’t I know I will get a time-out” is an example of extrinsic motivation. Johnny is following directions, but he’s not very happy. Finding out what your students are intrinsically motivated by may seem like an easy task. “I know Little Johnny likes to run around the room so his reward should be extra playground time.” This might motivate Johnny, but he may also think playing outside is too exhausting and doesn’t like to get sweaty. If this is the case, Johnny is not going to be as motivated to earn his reward. The best way to figure out a difficult student’s motivators is to just ask. Find out what they really like and create it into a reward. There are many reinforcement surveys on the internet that are designed for challenging students who really need a specific, well-thought reward. Other students will enjoy just about anything you offer. 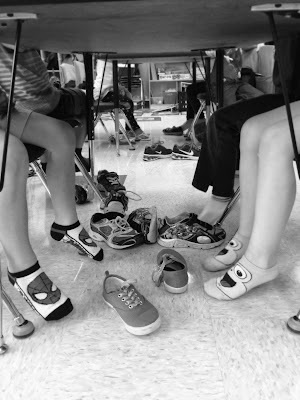 Almost all of my students get tired of having their shoes on at some point in the day- and I totally understand their frustrations- I hate wearing shoes too! They are motivated to make the right choices by being able to read a book with their shoes off and feel comfy while at school. The photo taken above was the first day I introduced this reward and all student got to “test out” having their shoes off. However, I would strongly advise not having the whole class’ shoes off for long periods of time. There will be a lot of shoes and laces flying everywhere if that fire alarm goes off lol! Want to know what the heck these are? Click here! 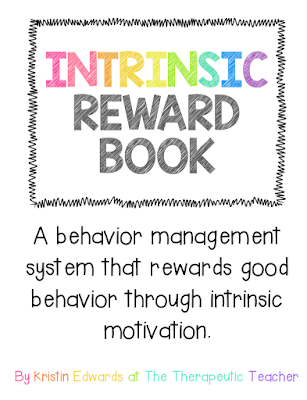 I create new rewards as my students come up with them, but I start with a basic list of reward ideas they can choose from called the Reward Book. Love your post! Do your students only get the reward when their bag is full, or each time they get a warm fuzzy?